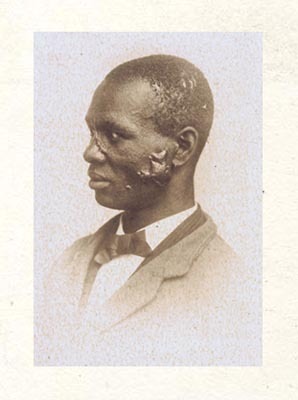 ABOUT EIGHTEEN MONTHS before the photograph was taken this patient had a severe attack of variola, which left considerable pitting of the face. About the time of leaving the hospital tumors appeared on either cheek, which have slowly increased in size. A small one was excised, but the growth reappeared almost as soon as the wound had healed. The lobe of the ear, which is sometimes the seat of cicatricial keloid, is unaffected in this case, although it has been pierced to hold a ring. The cause of keloid is unknown. Observation teaches that in the vast majority of cases it develops at some point where cutaneous injury has taken place. Negroes appear to be more frequently affected by keloid than white persons. Whether this is due to a peculiarity of the race or to the fact that their skins are more frequently pitted with variola, scarred by strumous abscesses, and disfigured by the lash, may be a question. Transparent—that's what they are, white people. grunting and jumping around a roasting man. and I added, "Yes, and in the heart, too,"
here in New York, where emancipation came in 1827! as a small gold earring could possibly mean.